Wheelwright Joe Fredericks received the David Bell Memorial Fund Award. After studying engineering, Joe secured an apprenticeship to develop his knowledge and skills of pre-industrial and industrial wheelwrighting. He plans to use the award to train with master wheelwright Phill Gregson and buy more tools. 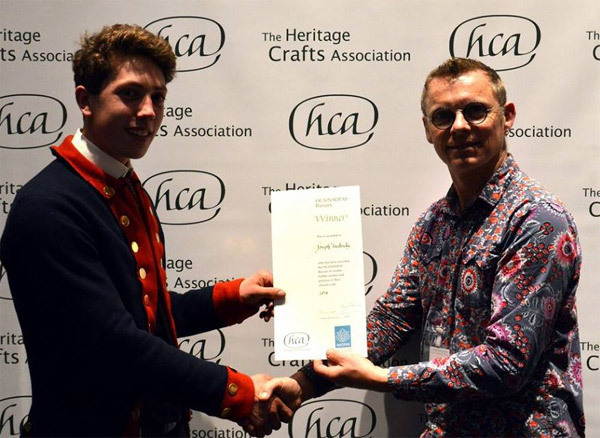 David Bell, who was Chief Executive of NADFAS from 2006 and a keen supporter of the Heritage Crafts Association, passed away unexpected in 2013 a few days after the launch of the inaugural Heritage Crafts Awards. This award is provided from money collected in David’s memory. We were honoured that Bridget and Alexander Bell, David’s widow and son, presenting the award at our 2016 conference.